Continuous High Speed mixers and Powder Mixer Manufacturers in India. A continuos mixer is an efficient machine used to blend different ingredients together. It can be used in a variety of different industries like Food, Chemical, Pharmaceuticals, Plastic & Composite & Construction Projects. With a continuous mixer, a steady flow of raw ingredients is fed into the mixing machine, and a steady flow of finished product is fed out the opposite end. The ingredients to be mixed are either fed to the mixer separately or in pre-mixed form. also liquids can be injected directly into the mixing chamber by spraying/dozing arrangement. 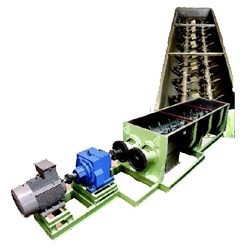 The shear mixing is achieved by developing shear stress and stain between the mixer blade tips and shell. In double shaft design blending is done by the kneading action between the mixing blades of different profile to suit different products and requirements. The mixing quality is homogeneous and precise. The final product measured in Kg/hour and Kg per batch. A continuous mixer option is opted when a project demands high volume and where speed and efficiency is a priority. Requires a smaller area due to small dimensions. Automated feed eliminates the need for refilling. Are smaller and more economical than Batch Mixers. Agglomerates dispersions in bulk materials. 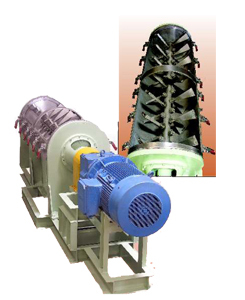 Raj Process - Leading Manufacturers of Chemical Mixer, Vertical Screw and Special purpose Mixers Blender in India for chemical, pharmaceutical, food, coatings, adhesives and other process industries.